UNSTAD, Norway — Ignoring hailstones and gusts of freezing wind, Rolf Hellem-Brusso straps on his neoprene mittens, picks up his surfboard and navigates his way across the rocky shoreline toward the icy Atlantic waters.The 20-year-old is a long way far from the sun-kissed beaches of his native Florida. But like the other participants in the Lofoten Masters — the northernmost surf competition in the world — he isn't here for comfort or warmth.Held on a remote beach in Norway's Lofoten Islands, an archipelago 100 miles north of the Arctic Circle, the competition is testament to the growing popularity of extreme cold-water surfing.Rolf's older brother William looks on from the beach, his face partially hidden by the fur-lined hood of his thick brown parka. It will soon be his turn to brave the water. "This competition is all about trying to overcome the extremeness of the nature around you — the cold, the rain, the snow and the hail that come down — sometimes all at once," says William, 24. "Surfing out here can be a spiritual experience: you're riding world-class waves in one of the most beautiful places on earth. "Lofoten is best known for its craggy cliffs, snow-swept summits and barren beaches. 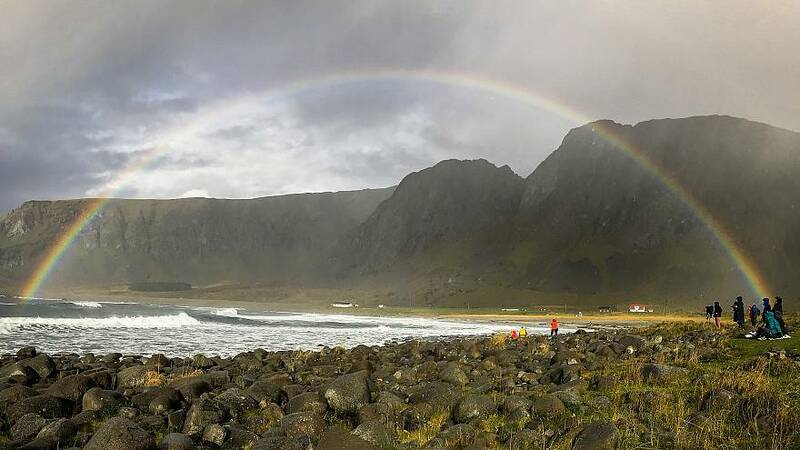 This polar wilderness is the last place where you might expect to find a surfing competition, but the Lofoten Masters has been going strong since 2007.Improvements in wetsuit technology have opened up some of the world's coldest water to a growing number of surfers. Many are drawn by the thrill of adventuring to remote frontiers in search of new waves and smaller crowds. "Back home, there might be 100 guys out fighting for a wave," says Rolf. "Here you've got it all to yourself — no crowds to battle — just a fun time with friends. "Whale stewUnstad — population: 14 — is an unlikely epicentre for the sport in Norway. Nestled in a rugged valley, the tiny hamlet is home to more sheep than people. But its beaches boast consistent waves and the town has not one, but two surf shops.Daredevils from around the globe have been coming here to brave the freezing waters, drawn by the awe-inspiring beauty. 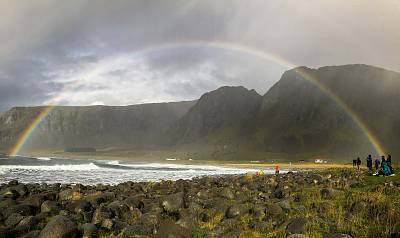 Norway's midnight sun offers 24-hour surfing during the summer. In the winter, surfers are treated to nature's greatest light show: the aurora borealis.Marion Frantzen and husband Tommy Olsen run Unstad Arctic Surf, which offers board rentals and surf lessons, a restaurant — whale stew is a popular menu item — and cabin accommodation.Inside, it looks like a Hawaii surf shop. A mannequin clad in a grass skirt and coconut bra decorates the dining room, Polynesian carvings line the walls, warm winter beanies are sold alongside Hawaiian hula dashboard dolls. A roaring fireplace warms the dining room, casting a soft glow over photographs of surfers trudging through snow or riding the chilly waters. "Arctic surfing has gotten much more popular in recent years because people are drawn to the thrill of discovering new coastlines and having a totally different kind of surfing experience," Marion says. Marion's father helped pioneer surfing in Norway. In 1963, fresh off a trip to Australia where he saw surfing for the first time, he and a friend decided to make their own surfing board out of discarded refrigerator insulation foam. They modelled it on the white and blue-striped board pictured on the cover of the Beach Boys' album: Surfin Safari. The board hangs inside the shop today. "Arctic surfing sounds scarier than it is," Marion says. "The wetsuits are thick and insulated, so you're very protected, but people don't realize that we actually get the Gulf Stream all the way from Mexico which means ice-free beaches and surfing all winter. "New facesBack on the beach, the competition continues.The judges sit inside a hut to protect themselves from the rapidly-changing elements. The hail and rain are eventually replaced by sunshine and a double-rainbow, which delights onlookers. Staying warm on shore is a struggle despite the protection of winter parkas, hats and gloves. 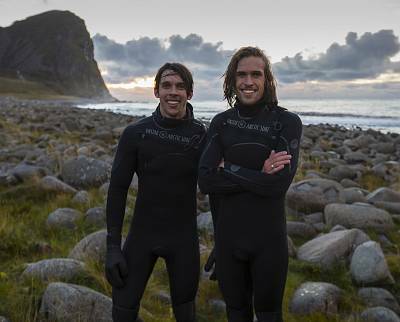 Some hop from foot to foot while chatting, their eyes fixed on the ocean, watching competitors ride the wintry waves.Rolf and William have been coming to Unstad for over a decade and say they see more and more new faces every year. But are they worried about their tranquil surf spot blowing up? "A little," said Rolf. 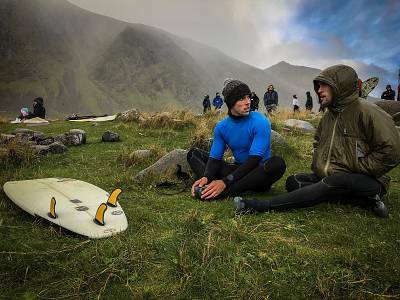 "But the cool thing about stoke [surfing thrill] is sharing it with others, so I'm happy to share this beautiful place with anybody."